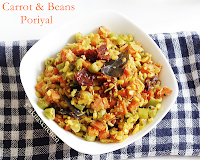 Carrot and Beans Stir fry or Carrot and Beans poriyal – is one of my sons favorite stir fry. Its always been a great task as a mom, to give some veggies to the children and need to run behind them to feed these veggies and say lots of stories to them. My children did the same, until they started eating this combination in Hotel Saravana Bhavan. 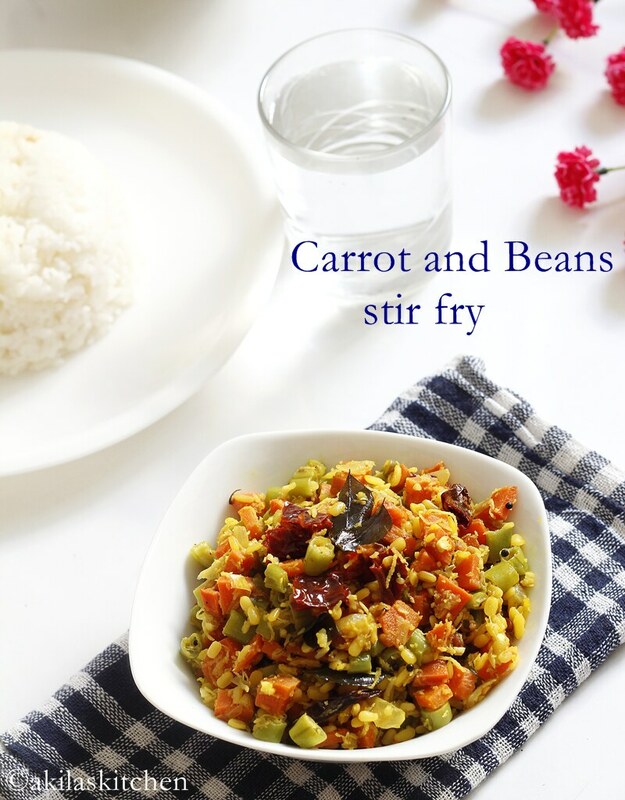 After having tasted this stir fry, my son, started a liking to this carrot and bean stir fry and whenever I used to buy these veggies, my son, asks me to cook this poriyal. This recipe is not for the experienced cooks, but for the beginners and bachelors. 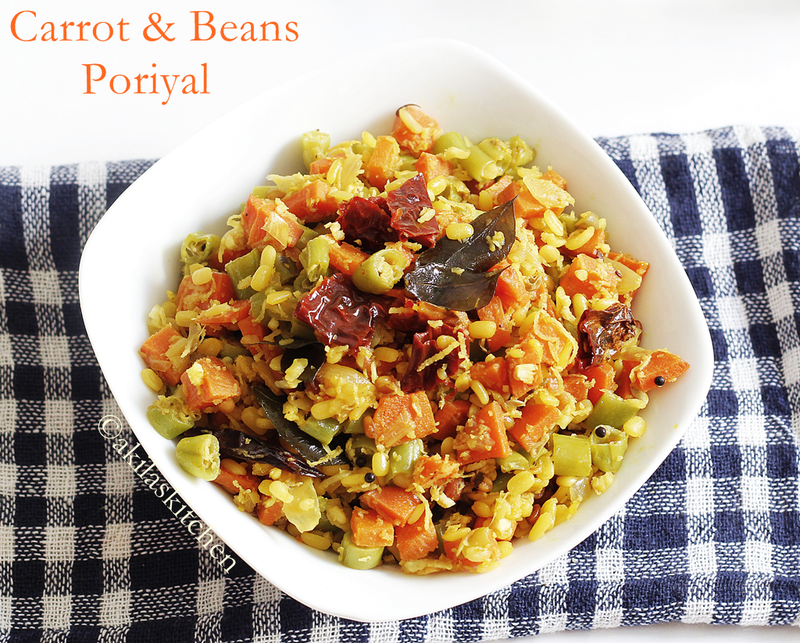 Now we go the recipe and see how to make Carrot and Beans Poriyal. 1. Wash and pressure cook the green gram / moong dal or paasi paruppu for 1 whistle with 1/2 cup of water. Drain the excess water and keep aside. (Dont cook more, as it tends to cook faster). 2. Cut the carrot and beans in to small pieces as shown. In a vessel, add oil and when hot, add in the black gram, mustard seeds and curry leaves. 3. Add the red chillies and fry for few min. Add the chopped onion and fry till they are translucent. Add in the salt and turmeric powder (optional). 4. Add in the veggies now sprinkling little water. Here you can use the excess water of the cooked moong dal if any or you can use the ordinary water. Do not add excess water as the veggies may over cooked and may loose their crunchiness. Add in the Moong dal now. 5. Give a stir and allow to cook. When the veggies got cooked, then add in the grated coconut and give a stir. 6. 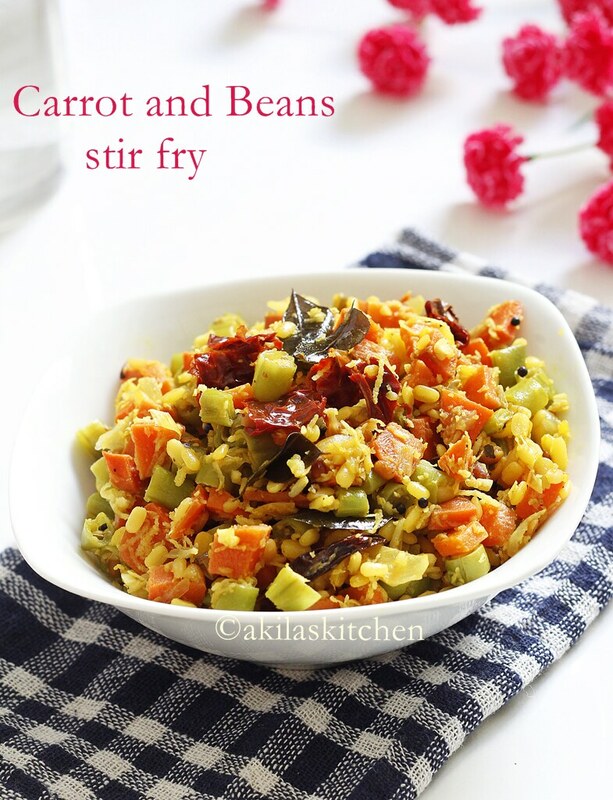 Serve the yummy carrot beans poriyal as the side dish for any rice. If you want, you may add sambar powder along with turmeric powder. If you do not like coconut, you can omit that too. Healthy Poriyal.. Love the addition of moong dal..
Hi Akila, your carrot with bean stir fry sure looking appetizing and delicious. Nice click. This looks heavenly Akila… OMG! 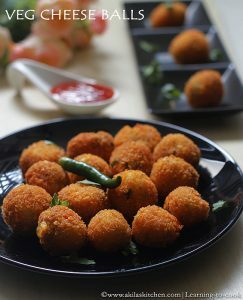 I'm so bookmarking this.. love South Indian subzis.. esp with coconut. great side for rice. we too do the same, but without the dal. I get tired with using carrots for salads, hence using it for stir fry with spices is a good chance. Because we eat rice mostly, this is a great match with rasam (another fav of ours). Its a very healthy option for breakfast Akila.. Yummy!! Its a very good option for a healthy breakfast..